But…but…I don’t see an anti-gravity helmet on the dog. That means…NOOOOOOOOOOOOOO! NOT POOR BULLETDOG! Awesomeness, thy name is Jeff Hebert. Too funny, bro! Maybe the collar is anti-grav? What kills me is that in that era (and to a great degree in modern comics) a theme is absolutely beaten to death. Bulletman and Bulletgirl have a Bulletdog … I’d give odds that they have a Bulletcar in the Bulletgarage at their stately Bullet manor or some such. All they need for the trifecta of bullet-ness is a Bulletgun that fires Bulletbullets. I will pay good hard cash money for a bulletgun that shoots bulletbullets. Because that is awesome. Just as a quick followup, first, very funny comments above, thank you everyone for a good laugh to start the day! Second, it’s striking to me how many of the things I thought were kind of special because I only ever saw them in mainstream comics from the Seventies on, were in fact very widespread and ripped off from Back In The Day. Batman had Ace the Batdog, and Superman had Krypto. I had no idea other heroes from the era had themed pets as well. I just wish Marvel had been around back then, because I bet we’d have Spider-Dog. Or Spider-Pig, with apologies to Homer Simpson. Or with a nod to NGpm, Spider-spider. OK, one more thing (apparently bullets inspire me) — I am continually struck by just how stupid the police chief is in Bulletman. His daughter and her boyfriend hang out with him all day at work, hear all the calls he goes on, and then Bulletman and Bulletgirl show up at the crime scene every time, wearing open-faced helmets that do nothing to hide their features. Then they get a dog immediately after a caper in which crime dogs are heavily involved. 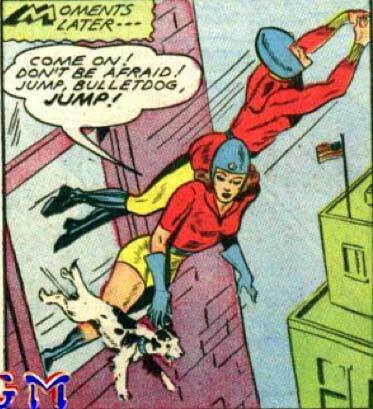 Then Bulletman and Bulletgirl show up with a dog that LOOK EXACTLY THE SAME as the one his daughter has. And yet, he has no clue that they are the town’s super-heroes. It just boggles the mind. Apparently the anti-gravity bullet collar also hides the dog’s secret identity, is all I can think. Unreal. So, the masters are whipped around by their heads and the dog gets flown about, hanging by his neck? Uh… I guess this is why superheroes should have Occupational Health and Safety classes. @the last Jeff comment: It’s sort of like the “Batman in the Garden of Eden” panel you used for a Random Panel a while back, huh? If they can make the metal in to a collar why don’t they wear it like that? Maybe with some cool bracers and greaves as well? And in the 80’s there was the title “Peter Porker is the Spectacular Spider-Ham.” It was a weird alternate world of, well, pig people. Obviously, this was before the grim-and-gritty phase took over Marvel. All they need for the trifecta of bullet-ness is a Bulletgun that fires Bulletbullets. Now all they need is a bulletchild, bulletcat, bulletmobile, and bullethouse! Of course, her father wouldn’t know about any of these things. The SCA is looking to serve them with a bulletfine. SPCA, that is. Stupis keyboarf.